Men’s Day Event- 2-Man Best Ball and Chili feed event on Thursday, March 28, 2019. Cost per member $10, $20 per team. Limited to 30 2-man teams. Chef will prepare three types of chili at a special price. 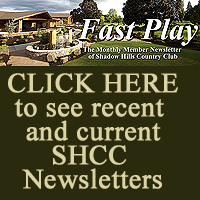 Sign up now on ForeTees or contact the Pro-Shop. Italian Tavola Dinner is scheduled for March 23rd. This will be a traditional Italian Dinner served in a Tavola Style. Servers will bring platters of food to your table for you to select, then serve you a portion. Each course will be brought to you in that style for you to choose. No ordering off menu. The staff will be in character as Italian Servers as if you were visiting Italy. It will be a lot of great fun and fun. · Friday, April 12th is Karaoke Night. Come sing your heart out to your favorite tune with your friends and family. Event starts at 8pm and is open to all ages. 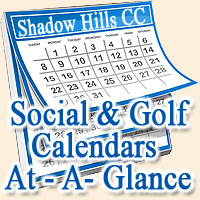 RSVP in the Lounge or email Jbrown@shadowhillscc.org. Golfer’s Breakfast from 6:30-1pm – 2 egg breakfast/ham and cheese omelet with home fries.